Pin Nailer vs Brad Nailer: Which is Best for Your Needs? Pin nailers and bard nailers are similar-looking tools that have some overlap in function. While there are some things they can do equally well, there are some areas in which either tool excels, and by using the right tool for that task, you can maximize the quality of the final product, and save yourself some frustration along the way. Pin nailers drive some of the smallest nails on the market. Generally, pin nailers use a 23-gauge, headless nail. The bigger the number, the thinner the nail. Since the nail is headless, people call it a “pin.” Having no head also means that pins leave a very small hole, which will not require wood putty in many circumstances. 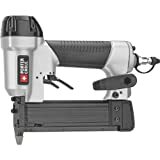 Most pin nailers use 1-inch pins, though in some rare circumstances you can find pin nailers with capacities up to 2 inches. Because pins are so short and narrow, it makes it hard for them to split wood, which means they’re good for use with delicate pieces. That also means that they won’t do a good job with heavy loads or thick woods. Most people don’t use them as a true load-bearing nail. Instead, they’re commonly used on pieces that are being glued on, as a way of holding the piece in place while the glue dries. Overall, pin nailers and heavy-duty work are a bad mix, but there’s not a better tool for making sure that your pieces stay in place while the wood dries. The lack of a head and small diameter means that you’ll rarely have to touch up with wood glue. Brad nailers are the next step up from pin nailers. They use “brad” nails, which are small as far as nails go, but still larger than pin nails. They have a small head, but they generally don’t leave a hole so large as to require the use of putty. However, they’re still larger holes than pins will make. If you’re looking to put the finishing touches on a project without using glue brad nailers should be your tool of choice. They’re especially good at attaching trim to a project, or for attaching molding to a cabinet. However, that doesn’t mean that they’re suited to heavy-duty work. The 18-gauge nails used by most brad nailers is still small enough that it can’t hold a lot of weight. 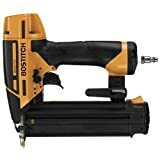 Also, the brad nailer is going to be as strong as a nail gun or finish nailer, so it’s unlikely that it could drive the nail all the way into plywood or other hardwoods. Overall, brad nailers good for situations where you’re doing finishing work, but you don’t want to, or can’t, use glue. You’re not going to be able to use them with hard woods or to support heavy pieces, but they excel in cosmetic applications since they rarely require the use of wood putty. Both pin nailers and brad nailers have their uses. Often, you can use either, but the pin nailer is going to be better for you if you’re planning to glue the pieces in addition to nailing, while the brad nailer is better for when you’re not going to be gluing at all. Crown Stapler vs Brad Nailer: Which is Best for Your Project? Siding Nailer vs Roofing Nailer: Which is Best for Your Needs?